I just got an old 2000 Specialized Stumpjumper FSR XC that still uses rim brakes. I also have this 160mm rotor and this mechanical disc brake caliper. Since none of my wheels have 6 bolt holes to mount disc brake rotor, then I need to get new wheel anyway. My goal would be to mount a fatter tire in front and leave skinnier wheel on rear (because in the rear I have electric hub motor and don't have much choice). 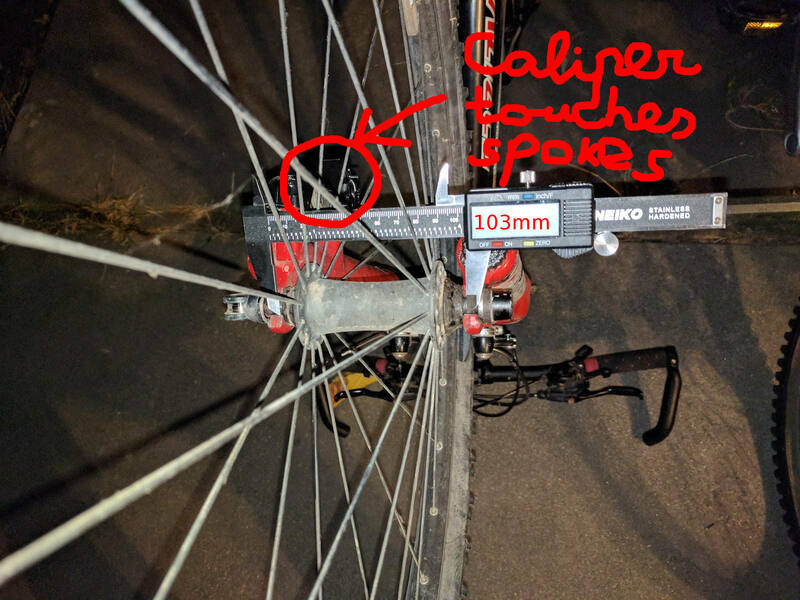 Why caliper touches spokes on the old wheel? Is it because I need to get adapter for caliper as well and it would move caliper away from the hub? Or is it because spokes on disc brake compatible wheels will be arranged in a more narrow manner around hub and hence will not touch the disc brake caliper? The fork leg to fork leg distance is 103mm as can be seen in the picture. How much wider wheel I could mount there? Especially - Do fat tire wheels have wider spoke arrangement at the hub area potentially reintroducing the "spokes touching disc brake caliper" issue? Would there be any issues with having fat tire on the front and this, somewhat skinny, tire on the back? The caliper is touching the wheel because the caliper was designed for a disk to be there, but the wheel was designed for spokes to be there. With a disk-brake wheel, the spoke flange on the hub is moved closer to the centerline to make room for the disk, which would be where the spokes are now. There are only a few standards for mounting disk brakes, which determine where the disk and caliper should be relative to specific points on the bike. Unless you want to mess around with adapters, you need to make sure all your parts fit the same standard. 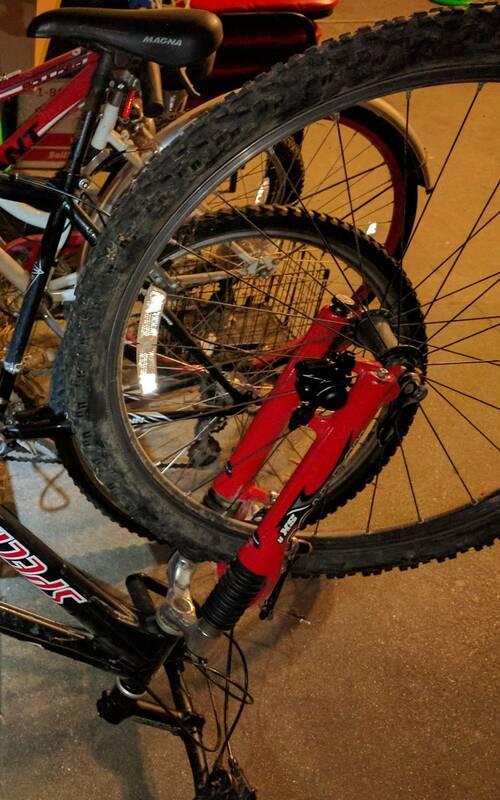 I'm guessing your fork uses the 74-mm post mount standard. This distance is called the over-locknut distance. Almost all bikes use a 100-mm standard for the front wheel. There's a more recent 110-mm standard (called "boost"). The fact that you're getting 103 mm is probably a measurement error, but that's a 100-mm hub, and you should continue to use 100-mm hubs. Not really. It's not clear exactly what kind of rim is on that motorized wheel, but you can probably mount a fatter tire on it if you want. Not the answer you're looking for? Browse other questions tagged brakes wheels disc-brake electric-bike fatbike or ask your own question. How do to determine if an adapter is needed for disc brakes and rotors? Can you use an Alfine 8-speed “disc” hub with a non-disc wheel?